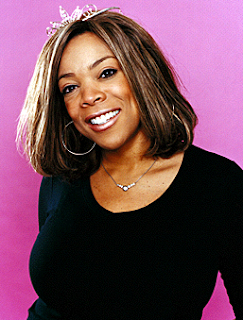 On Tuesday night, Wendy Williams was eliminated from Dancing With The Starts 2011. I was sad to see her leave the show so early, but her scores were terrible. Today, however, I couldn't wait to see how Wendy Williams would react to her dismissal from DWTS. She proudly marched out to begin her show, sporting a big broad smile. Wendy got right to the point and explained her departure from DWTS with self-deprecating humor and raw honesty. It was nine minutes into her show before the tears came out. Wendy does cry a lot - but regular viewers are accustomed to her emotions always being just below the surface. Wendy showed a tape of the moment she was eliminated from Dancing With The Stars 2011 and clips of farewells from the other cast members. Then, Wendy brought out her dance partner from DWTS, Tony Dovolani. To thank Tony for all of his hard work, trying to get Wendy to dance with grace, she gave him a trip for two to the British Virgin Islands. Tony had a gift for the audience, both in the studio and at home. Tony runs dance studios in the east with Maksim Chmerkovskiy - Kirstie Alley's dance partner on the current season. Tony and Maksim are offering a FREE 30-minute dance lesson at any of their studios - a Wendy Show exclusive. If you live in the east, you can access the offer at WendyShow.com. Wendy's first guest was the timeless supermodel and business mogul, Kathy Ireland. Ironically, Ireland was on Dancing With The Stars and had the same partner as Wendy - Tony Dovolani. Ireland was bumped from the show in her second week of dancing. Yesterday, Susan Lucci (All My Children) was on the Wendy Show, and she too had Tony Dovolani as her partner, but she made it through seven weeks of the show. Hmmmm... all three had Tony as a partner and all three got bumped... Do I sense a pattern here? When Ireland came out and sat on the couch she pronounced, "Wendy, you got robbed. Robbed, robbed, robbed." Robbed or not, Wendy's still out. Now she can relax. It was brutal for her being bi-coastal - doing a daily show in New York and having to fly to Hollywood to perform on DWTS. Wendy said it would take a couple weeks for her feet and hip to stop smarting. In a way, she was glad to have the pressure released. Wendy also officially retired her Mirror Ball Ring. After taking it off, she shouted, "I'm back!" Another highlight of the show, Wendy announced that she will be on the cover of the May issue of Essence Magazine, then unveiled the cover to wild applause from the studio audience. Even though Wendy Williams won't be on Dancing With The Stars, she won't be going away, like some of the contestants. You can still tune in every day for the Wendy Show. Check your local listings for time and location. Better... my feet will finally stop aching.